Choose your Narrow Boat and Start Location. We have a choice of boats sleeping 2 to 12 people. Our locations are situated throughout England, Scotland and Wales. 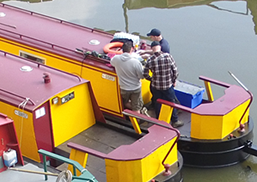 Boat and lock training is given on arrival and is included in the price you pay. Online secure payments. We accept the above cards. Other charges may apply and will be calculated and shown on the booking form. The full cost of the holiday will be displayed before you confirm the booking. Prices are per boat, not per person. Now that we know how much damage our flights abroad are doing to the environment, why not stay in Britain this year and take a greener narrow boat holiday on Britain's very own picturesque canals? Our narrow boat hire breaks offer you an environmentally friendly alternative to flying. You can have a great narrow boat holiday at an affordable price that doesn't have a huge carbon footprint. 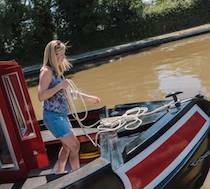 Our narrow boats run on diesel and are nice and compact; They burn so much less than your car would as you meander down the nation's picturesque British waterways. The rest of the narrow boat's power is simply generated by the running of the engine. Our choice of narrow boat marinas dotted across the country are never too far from your front door. Quickly and easily you'll find yourself immersed in a totally different British cultural experience. For breathtaking views and awe inspiring feats of engineering cruise your narrow boat along the Llangollen Canal. 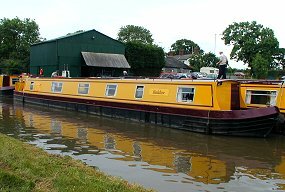 Begin you Narrow Boat Hire Holiday from Blackwater Meadow Marina in Ellesmere (one of our many starting locations) and be prepared to be amazed.